Bare bulbs in wire cages light Aspect staff’s way down a flight of stairs through a damp concrete passage. One after another, we duck our heads, crawl through a water-tight steel hatch, and emerge in a cavernous chamber lit by a single halogen shop light. Our breath hangs in the cold air, and the sound of water drips from the surrounding shadows. Our guide tips back his hardhat, stares upwards, and explains that we have now descended 150 feet below the surface of the Columbia River. He points with his flashlight towards the middle of the room, to where one of Wells Dam’s Kaplan turbines—a five-bladed spinning top the size of a garbage truck—sits idle. A month from now, when this chamber is again flooded by the river, water will push against those blades, turning a shaft that will activate a generator, create a charge, and produce electricity—enough to power all the houses in the Wenatchee Valley, and then some. The switchyard and gantry cranes along the top of Wells Dam. Fifty miles downstream of Wells Dam, geologists and engineers in Aspect’s Wenatchee office regularly interact with hydropower in our week-to-week work. From evaluating utility district water rights, supporting environmental compliance at fish hatcheries, to helping clients adhere to FERC permit requirements, the influence of dams in the Northwest is far-reaching. When Douglas County PUD offered us an invitation to visit Wells Dam, which celebrated its 50th anniversary earlier this year, Aspect Wenatchee jumped at the opportunity. Wells is the only dam in the U.S. designed as a hydrocombine, where the generating units, spillways, fish ladder, and switchyard are vertically stacked (as opposed to horizontally aligned). This gives the dam its compact footprint but presents certain logistical challenges for major maintenance operations. Like all Columbia River hydropower projects, Wells is a run-of-the-river dam. Reservoirs created by run-of-the-river dams have limited capacity to store water and must respond to fluctuations in seasonal river flows. For dams on the Columbia, this means that most of the available water comes from snowpack and is in greatest supply during the spring. Generating power at Wells represents a balancing act between storing and spilling water. In addition to coordinating reservoir levels with upstream and downstream dams, operators must forecast and respond to the Methow and Okanogan rivers, which eventually flow into the Columbia, all while complying with a suite of regulations for the protection of fish and wildlife, and fluctuating market demands of the regional grid. Like anything that involves a complex assortment of moving parts, things inside a hydropower project eventually wear out. For Wells, turning 50 means that each of the 10 generating units is reaching its in-service design life. Work is actively underway to completely refurbish, replace, or re-machine the turbine components to extend their service life another 30 to 40 years. We greatly appreciated the tour and getting an up-close look at one of our region’s hydroelectric projects. Happy 50th Anniversary, Wells—thanks for keeping our lights on! For many Aspect staffers, the dry summer months are usually spent out in the field. This season, it was true in more ways than one. 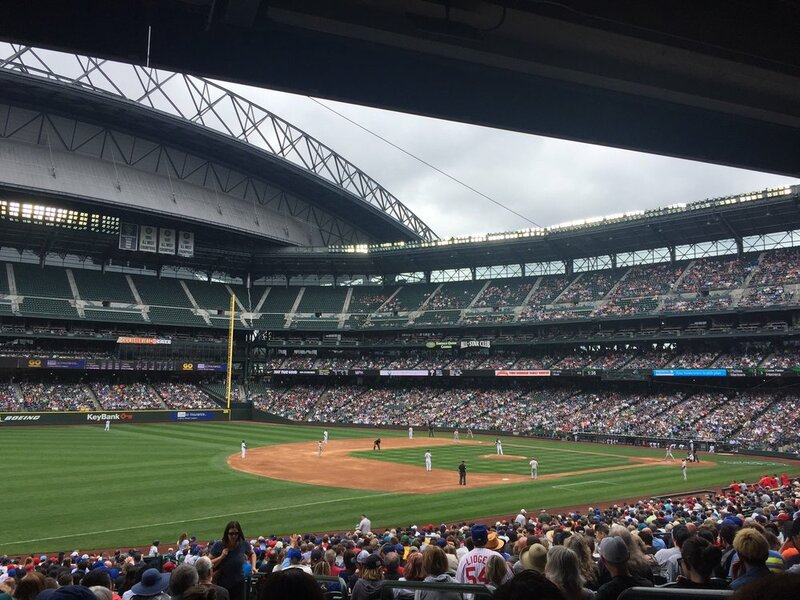 Our summer was bookended by sporting events that took us out into the “fields” down the street from our Seattle office. 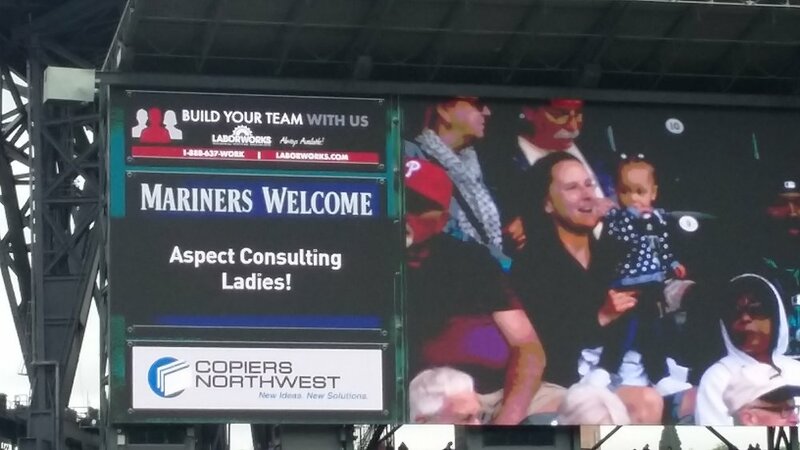 In June, the women of Aspect attended a Seattle Mariners matinee game vs. the Philadelphia Phillies at Safeco Field. Adorned in matching tees made especially for the outing, the group indulged in gigantic soft pretzels and other ballpark sundries in between cheering for pitcher Felix Hernandez’s fine outing and the Mariners’ three home runs of the day. In August, Aspect staff was three rows strong (and several garlic fry orders deep) at Century Link Field as the Seattle Sounders took on the Portland Timbers. Despite both team’s valiant efforts and the ever-present cheers from the crowd, the final score was 1-1. The tie may be frustrating for most fans, but it did make for far less tension between the Seattle and Portland offices at staff meetings the next morning. Finally, in September, two Aspect teams (Aspect Earth and Aspect Water) participated in the 2017 Kickball Without Borders Event - a fundraiser organized by the Puget Sound Chapter of Engineers Without Borders for its international projects in Nicaragua, Uganda, and Sierra Leone. We showed up, we tried hard, we had fun, and we exited the tournament early with pulled hammies and bruised egos. There's always next year!